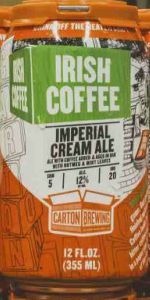 On tap at Beef Trust, Carton’s highly exulted Regular Coffee Imperial Cream Ale gets soaked on Irish wood and given a peppermint twist. Creamy milk-sugared coffee frontage picks up sweet vanilla-chocolate tones, wispy green creme de menthe freshener and distant cappuccino, caramel latte and espresso macchiato snips. A richly fulfilling dessert treat.